1N3-WG864 - Approximately 7.5 inches long, each knife features a 3.5 inch double-edge blade. Are you prepared for the Zombie Apocalypse? 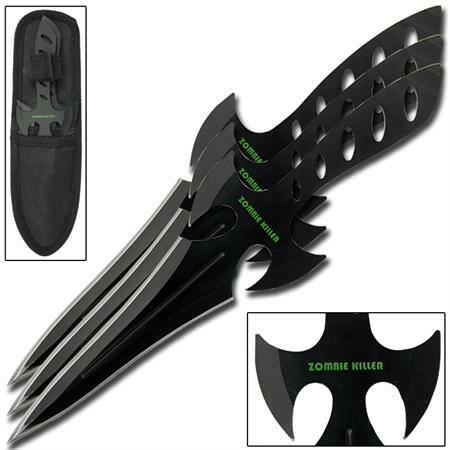 With a unique design featuring midnight-style wings that allow the knife to zip through the air, these dynamic throwing knives are sure to hit the spot. Approximately 7.5 inches long, each knife features a 3.5 inch double-edge blade that is very sharp and ends in a piercing, pin point tip. Very thick and sturdy and made from 440 stainless steel, a powder coated black finish strengthens the steel and gives the stars a notable look while also serving to prevent rust. Each blade offers a silver lining that makes for an attractive look while a Zombie Killer stamp on the blade lets you know exactly what this knife is made for! 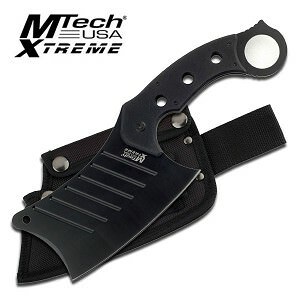 The package includes 3 individual knives plus a FREE black nylon carrying sheath with individual compartments for each knife.